Disclosure: products in this post were provided by the manufacturer, their PR firm or retailer for my review. Happy Friday everyone! I hope that you all are having a good summer and have some awesome plans for the weekend. Today, I’m having a study marathon today. I completely forgot to include this in my “Quick Update” post a few days ago, as to why I’ve been slightly absent from making videos, but I’m taking the MPRE’s tomorrow. In a nut shell, its an ethics exam for lawyers on the rules that members of the profession have to follow. If you don’t pass, you can’t be a lawyer. So its a tad stressful. I use polish to de-stress so today I have another Shimmer Polish for you guys! I have really fallen in love with this brand. Each polish I’ve tried is a gorgeous glitter but not over the top. This one has the most colors out of any that I’ve tried, but somehow it works. Even my best friend tried this polish over another polish and was blown away! I wish you all knew her, because I think she has 200 polishes all in the same shade of berry and all a creme finish! Needless to say, she doesn’t go outside the color and finish box all that often. 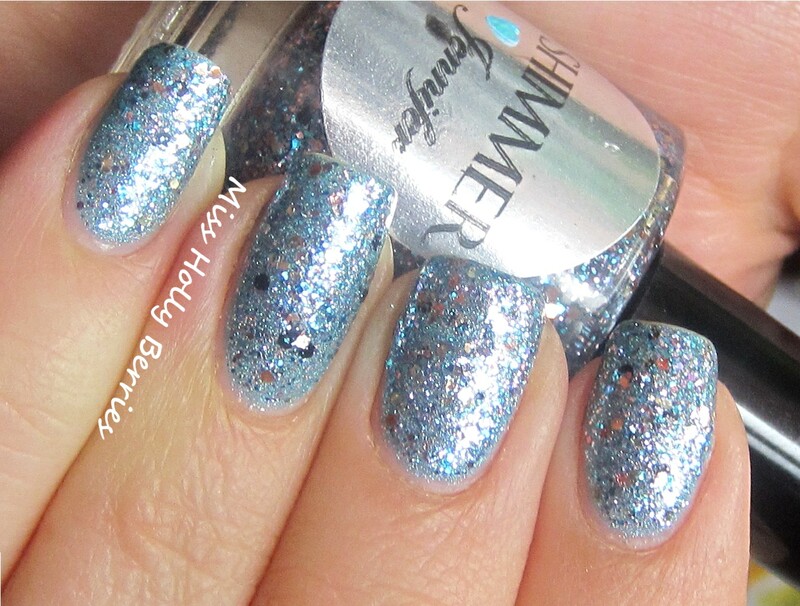 Shimmer Polish “Jennifer” is described as a light blue pastel glitter. Well, there are a ton more colors in there than just light blue! 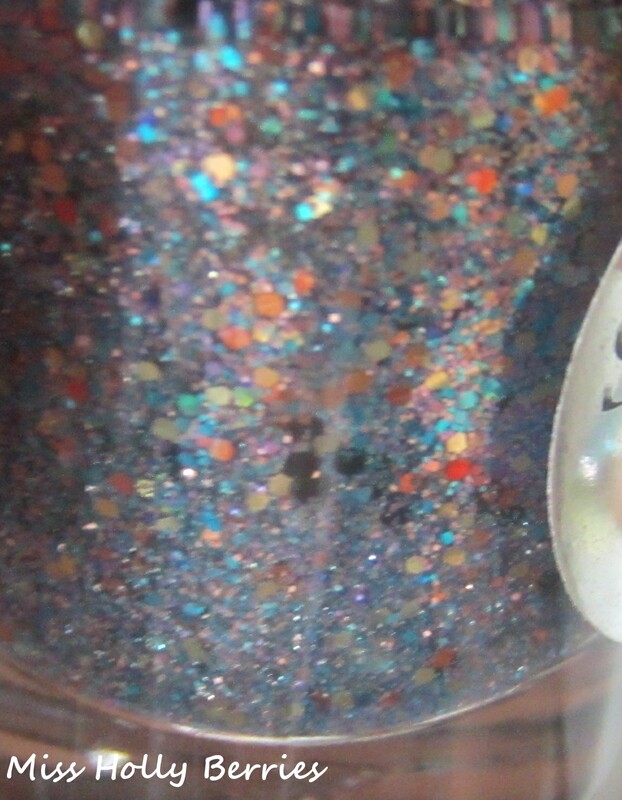 I had to include a macro shot of the bottle so you guys can see how many different colors are in there! This polish is made of light blue, dark blue, light purple, cooper, iridescent, silver and matte black! And there may even be some more colors in there that I didn’t see! The formula on this polish was spectacular! All the pictures above show the polish on its own! There are no undies with this glitter. Its opaque in 2 thick coats or 3 thin. I have 2 thick coats here because, well, I’m lazy. But you can see how much this polish shines, and dare I say shimmers, in the light. And the black just makes it that much more interesting. It wasn’t too thick and dried really quickly. I think this one might be one of my favorites of all the Shimmer Polishes I’ve tried! What do you guys think? Do you have any shimmer polishes? You can get Shimmer Polishes on her website or her etsy site! ← Ulta and Walgreens Haul!! Nope. But sure want to try some. Heading over to the site now. Love the blue- my fave color. I love this polish it looks beautiful. And good luck for your exam 🙂 I’m sure you’ll do great! yeah cindy makes some amazing polishes!! yeah it really is super unique! i’ve never seen a mix like this one and have it be completely opaque. thanks for commenting!